Mr. Cabañas is a civil engineer with a specialization in Cadastre and a specialization in Telecommunications Technologies, with 19 years of experience working in telecommunications industry. 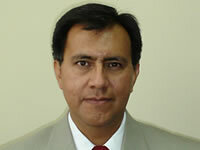 As President of Central American Association for Aeronautics and Space, Chapter Guatemala, Mr. Cabañas is working in the implementation of a Center for Technological Research and Development with the cooperation of private and academic sectors and financial support from Guatemalan Government. In a first stage, this Center will carry academic programs related with small satellites (CANSAT Program) and in a second stage the Center will work in construction of satellites and non-traditional energy sources and its applications in transportation devices. From the international cooperation perspective, he participated in the 2011 CANSAT LEADER TRAINING PROGRAM (CLTP) at the University of Wakayama, Japan. He also participated as an expert in the follow up meetings to conform the Action Plan of the 6th Space Conference of the Americas (VI-CEA) to promote the pacific use of space technologies in America and was President of Working Group No.4 “Technological Development” of the VI Space Conference of the Americas (Hidalgo, México 2010).